Please remove the first link as it was linked to the wrong post..I'm sorry for the mess up! This is utterly super! I'm actually early for school. Whoo-hoo! Thanks for hosting, Miss Jenny! Hi Jenny -- my post is about a collage class I'm taking, and I'm feeling UNUSUALLY creative! Yes, an umbrella that covers us from all dangers. Greetings. Hi Jenny! I see you did a great job in making blog. Everything looks amazing. It makes me wanna read something. Nice! "Up and at 'em" was a favorite phrase of my dad's to get us kids up on Saturdays...wonder if anyone ever uses that phrase♫♪ Thanks for hosting! 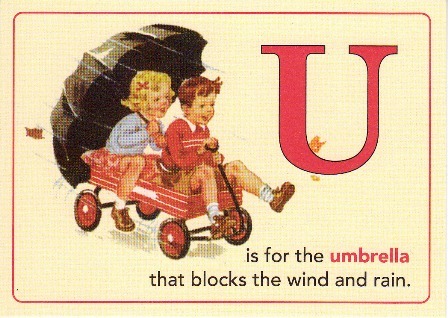 U is also for UHH...and DUH for my last alpha post! That's what happens when you're rushing. Very UNSUITABLE! Don't mark me down too much...please Mrs. Matlock! I didnt make it this week to class for the letter "U", but wanted to stop and say hello! I hope to join in for the letter "V"! Also, Miss Jenny, I tried a few times to click on to the link #51 Alphabet Thursday-understatement and it would not allow me to view? Thanks! Lmkazmierczak, you took me back in time! Yep, I heard that phrase a lot growing up! Jenny, thanks for continuing with this wonderful meme! It's my favorite! You are amazing keeping up with everyone here in blogland! http://annkschin.blogspot.co.nz/2012/10/alphabe-thursday-letter-u-for-ufo.html sorry I drafted my post but forgot to post it, it is late.